In order to understand what pranayama means we must understand what prana is. In Jnana Yoga understanding is most important. Understanding is not done in the brain but in something that stands under - in the heart. Is it possible for us to relate our intelligence to prana without the brain? Can I look at this prana without thought? 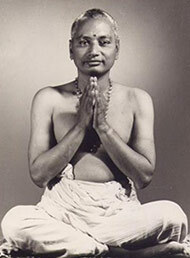 The sages who practice Jnana Yoga have no technique. Just as you are looking outside, look within and find out what keeps you - this body and mind - alive. That is prana. But what do you do? The very simplicity of it makes it almost impossible. Then some masters come down a little bit and indicate something like a technique, using the following method which is found in The Yoga Vasistha. As you breathe in and out normally, see if you can become aware of the exact moment when inhalation becomes exhalation and exhalation becomes inhalation. In that meeting point you'll find prana. There must be some kind of observation which is independent of thought and therefore of the ego. That observation observes this movement of breath. If you can do it, God bless you. If you cannot do it, then the Hatha yogi says, "Hit this prana." The idea is to challenge this prana so that it becomes clear "This is prana". The question that is asked is the same as in Jnana yoga: "What makes me live?" Here in Hatha yoga the emphasis is on kumbhaka. Kumbha means a pot and kumbhaka is making the abdomen like a pot. First there is puraka (inhalation), which literally means filling this pot. When you inhale, you find you cannot go any further. What makes you stop? That is prana. But because you are inhaling with force, that prana becomes more detectable. Then comes kumbhaka - holding the breath as long as possible. I should not exhale, prana should force the exhalation. At that point, if the observation is keen, there is the direct understanding, "This is prana". Unfortunately we usually don't reach this point at all; we hold for some time and then feel it is a bit uncomfortable and breathe out. There is this cerebral activity again. The mind begins to calculate. You breathe out - which means the prana has not yet been challenged - and therefore this is not pranayama. Any action that needs justification is already wrong.